Since starting in 2005, there are currently over 4 million subscribers. The subscribed member can get identity protection for credit and non-credit services. Offers flexible subscription plans so you can choose your desired level of protection and budget. There is a 60-day money back guarantee for unsatisfied customers. Life Lock is an identity theft protection service that started in 2005 by Robert Maynard Jr. and Todd Davis. Life Lock headquarters is in Tempe, AZ. In February 2017, the company became a part of Symantec. There are currently over four million subscribers to Life Lock. The goal of this service is to detect fraudulent activity for credit and non-credit related services for the subscribed member. Life Lock is a leader in the field of identity protection. This company used patented technology, science, and unique data to protect subscribers and remain in the forefront of innovation. Life Lock is also an advocate for change within the current system to fight against identity theft. This company also supports research, which allows the spread of knowledge around identity theft. Identity theft is a progressively increasing concern for Americans in the United States. A survey completed by The Harris Poll in 2018 showed that in 2017, 16.7 million individuals were affected by identity theft in the United States. This number has risen steadily since 2014, adding at least one million additional victims each year since that time. What does Lifelock do for me? Do you really need Lifelock? Is Lifelock worth the money? Which Lifelock plan is best? How much does Lifelock cost? What does Lifelock ultimate cost? What is Lifelock ultimate plus? What does Lifelock basic cover? Does Lifelock have a family plan? How much does Lifelock cost for a family of 4? When did Symantec buy Lifelock? Is Norton identity protection the same as Lifelock? How long has Lifelock been around? How do I sign up for Lifelock? What information do you have to give to Lifelock? How to cancel Lifelock membership online? How hard is it to cancel Lifelock? Can I cancel Lifelock anytime? Can Lifelock freeze my credit? Does Lifelock show credit score? What is Lifelock identity alert system? Does Lifelock protect social security? How does Lifelock protect my identity? Does Lifelock monitor bank accounts? Does Lifelock monitor credit bureau? Does Lifelock monitor the dark web? How safe is Lifelock wallet? What is Lifelock command center? Can Lifelock prevent identity theft? Is there anything better than Lifelock? Why is Lifelock banned in New York? Are Lifelock fees tax deductible? Does Lifelock cover your spouse? Identity theft is defined as acquiring and using someone’s private and confidential identifying information through fraud. Most often, the purpose of identity theft is for financial gain. Identity thieves may not even obtain your information from you directly; it can be acquired through public records, like electoral rolls. It can be taken from your trash, or the dumpster of a company you do business with. Skimming credit or debit cards is another way to steal information, as is shoulder surfing. Shoulder surfing is when someone who watches over your shoulder when you are in a public place providing personal information to another entity. Data breaches are also a common way to obtain personal information; this is when a company that collects some sort of personal information (anywhere from a bank, to Target, to Panera, Saks Fifth Avenue, or a credit card company) is hacked in some way that their data is stolen. Phishing emails are another easy way that criminals obtain your information. They may request specific personal information directly by impersonating a legitimate source, or they may try to get you to click on a link that will, unbeknownst to you, install malware on your computer to report information back to the criminal source. Though there are many ways that identity theft can happen, most of this type of theft can be neatly placed into six major categories. These categories are Employment or tax related fraud, credit card fraud, phone or utilities fraud, bank fraud, loan or lease fraud, and government fraud. Employment or tax related fraud occurs when your social security number and other personal information is improperly used to gain employment or file taxes or receive a tax return. This is the most common category, accounting for thirty four percent of fraud. Credit card fraud is almost as popular, making up thirty three percent of fraud. Credit card fraud occurs when a victim’s credit card or credit card information is used to make purchases that they are not aware of or that they have not approved. Phone or utilities fraud and bank fraud fall into the next two spots at thirteen percent and twelve percent of fraud, respectively. When a criminal uses your personal information to open a utility account, or wireless phone account it is considered phone or utilities fraud. Bank fraud describes when personal information is stolen and subsequently used to take control of an existing account. Bank fraudsters may also use stolen information to open a new financial account in another person’s name. Constituting seven percent of fraud each are loan or lease fraud and government or benefits fraud. Government or benefits fraud is when a thief uses stolen personal information to get government benefits or documents. Loan or lease fraud describes when a borrower or leaseholder has used stolen information to acquire a loan or lease. You may have noticed that these percentages add up to more than a hundred percent, this is due to instances of fraud involving more than one type of theft or fraud. It is common that once your information is stolen, criminals will use it in a myriad of ways. Signing up for Life Lock is easy and relatively quick to complete online. After answering a few questions and providing a small amount of personal information, you will be able to begin to enjoy the benefits of subscribing to Life Lock. The initial set up for this services includes the ability to download Norton Security software on up to five devices. This means that you can secure your phone, your computer, your laptop, and your tablet, with the ability to still add this software to an additional device. The use of this security software can assist in securing your devices in several ways. Norton Security software can prevent and remove malware, enable a personal firewall, protect you from phishing attempts, and provide you with email spam filtering. Once you have completed your subscription, Life Lock will alert you to potential threats to the security of your identity, personal information, and credit. If there is an issue detected, there is no need to worry because a dedicated specialist will work with you on your case from start to finish. A plan with Life Lock will cover personal expenses incurred and reimburse stolen funds that were a result of identity theft. Life Lock will also cover lawyers and experts if needed if you do become a victim of identity theft. This protection is available for anyone who is a United States resident and eighteen years of age or older. However, you are also able to sign up minor children under an adult’s account. The set-up process for this protection takes only minutes. Life Lock requires that you enter your full name, email address, physical address, date of birth, social security number, and phone number through the online portal to begin the process. Life Lock also asks that you provide a valid driver’s license and a credit card. There are three membership plans available, providing different levels of protection at price points affordable for a variety of consumers, ensuring that protection is available for everyone. 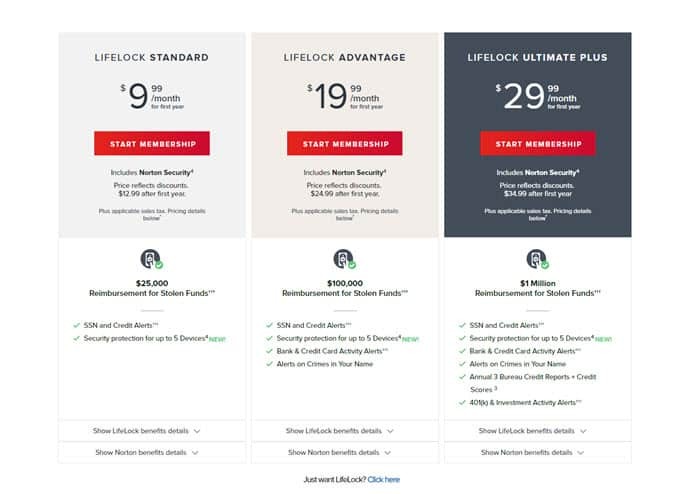 These tiered plans are called Life Lock Standard, Life Lock Advantage, and Life Lock Ultimate Plus. The selection of plans enables a variety of people to protect their identity, at any price point. The same three plan levels are also available without Norton Security Software as well, if you are not interested in that aspect of Life Lock protection. The lowest cost, most basic plan, is Life Lock Standard. The cost for this plan is only $109.99 annually or $9.99 per month, if you choose to pay in installments. This plan will cover stolen funds and personal expenses up to $25,000 for each category. Analysis from lawyers and experts will be covered up to one million dollars. With this plan, you will only receive alerts related to your social security number and credit. With this lower level plan, Life Lock monitors key changes to your credit with only one of the leading credit bureaus. Social security number and credit will also be monitored, notifying you of any inconsistencies or concerns via email, phone, or text, depending on your preferences. This option also offers dark web monitoring, which means Life Lock will notify you before your identity is destroyed through stolen information. To do this Life Lock monitors data that identity thieves are looking for, posted on over 10,000 websites. This package also includes Lost Wallet Protection, which will help you to regain control over the contents of your wallet after it is stolen. Address Change Verification is another helpful aspect of this plan. Life Lock will notify you and request validation for any address changes under your information. This verification and validation is important because criminals will often try to divert your mail to obtain other personal information, stopping this before it begins is crucial. The next level of subscription is Life Lock Advantage. This plan provides more coverage than Life Lock Standard and slightly less coverage than Life Lock Ultimate Plus. Life Lock Advantage costs $19.99 per month or if you prefer one yearly rate, $219.89 each year. Subscribing to this plan will get you everything contained in the Life Lock Standard Plan and additional benefits. A subscription to this plan will enable you to receive up to $100,000 for both stolen funds reimbursement and personal expense compensation and up to one million dollars in coverage for lawyers and experts to represent you. This intermediate plan will also alert subscribers to bank activity, credit card activity, social security number alerts, credit alerts, and alerts to crime happening in your name. The top tier of protection offers the Life Lock Ultimate Plus plan. This plan has the most coverage you can get through Life Lock, it also the most expensive costing $329.99 each year or $29.99 monthly. In addition to all of the benefits of Life Lock Advantage, with this plan, you will receive up to $1 million for each category including stolen funds reimbursement, personal expense compensation, and lawyers and expert coverage. Subscribers to the Ultimate Plus plan will receive social security number and credit alerts, bank and credit card activity alerts, alerts on crimes in your name, three bureau credit reports and credit scores, and 401(k) and investment activity alerts. There is a fourth type of Life Lock protection with Life Lock Junior. This is for children under eighteen years old, when a parent already has a subscription with Life Lock. This will monitor children’s information on wireless services, retail credit, mortgages, utilities, auto loans, payday loans, and credit card applications. Additionally, the child’s social security number will be monitored to ensure that it is not being used on any credit files. Also, with this plan, the subscriber will benefit from the dark web monitoring described above. This will guarantee that the personal information of your child is not being sold to nefarious individuals. Because children and teens are usually active on the internet, this plan also searches peer to peer sharing websites to be sure their personal information is not exposed. This is a great add on plan particularly if you have children that are active on the internet and you are concerned about the safety of their personal information. 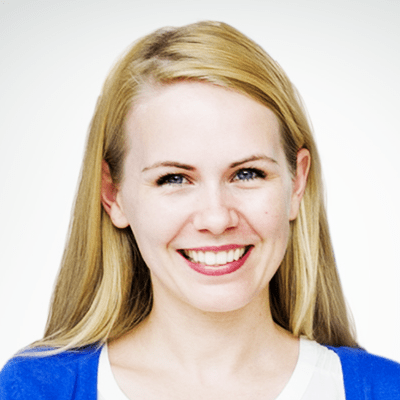 There are many positive attributes that make Life Lock an appealing service. First of all, Life Lock provides a sixty-day money back guarantee, so if you realize that the service is not meeting your needs, this allows you sixty days to change your mind and incur no cost. Life Lock subscribers also have access to customer service twenty-four hours a day and seven days a week. This accessibility enables you to call with questions or concerns whenever you have the time or whenever the question arises. The Life Lock service also monitors your credit as well as bank accounts for suspicious activity. This not only gives you peace of mind, but it also prevents thieves from accessing your credit and anyone from applying for new credit in your name without your consent. This service can also abolish the need to freeze your credit. Instead, your credit will be monitored constantly, and therefore it will be protected. The Restoration Department of Life Lock is based in the United States of America, and will work with you and on your behalf from the beginning of your identity theft concern to the ending. You will not be alone if your identity is stolen when you have a Life Lock subscription. There are however some limitations to the services that Life Lock is able to provide. The biggest deterrent for potential consumers is probably that the monthly subscription fees increase by about $5.00 a month after the first year. If you pay by the year, all at once, this does not affect you, but the convenient monthly option does cost more the longer that you are enrolled. Additionally, full family coverage can become quite expensive, depending on the size and needs of your family. You are able to add children under 18 years of age to your account for an additional fee of $5.99, utilizing the Life Lock Junior plan; but, children over 18 years old and your spouse have to purchase their own plans. 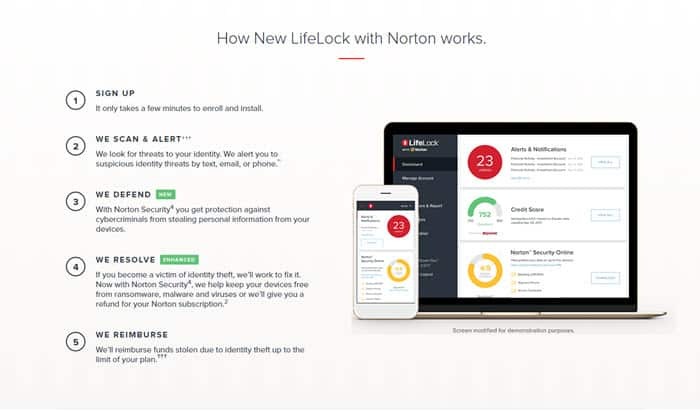 In addition, the main software that Life Lock uses is Norton Security, so if you are not a fan of that software, Life Lock may not be for you. Norton Security does not support iOS devices, so it may not be helpful if all of your devices are iOS powered. In addition, the highly touted Identity Restoration Service is only available during their limited business hours. You can reach customer service at any time, but this specialized team has more limited hours. This is potentially problematic for the subscriber because identity theft can happen at any time of the day or night and the speed of the response to this problem is critical to the amount of damage incurred. If something happens, you do not necessarily want to wait twelve hours for the office to open up again to deal with the problem. And finally, Life Lock only covers individuals. Therefore, if your business tax or credit card information is being infiltrated, you will not be able to track it through this program. This is especially problematic for small businesses looking for an easy way to keep an eye on their investment into their business. It can be argued that many of the services Life Lock offers can be done on your own, possibly even for free. This can be mostly true depending upon which level of Life Lock services you are looking at and the sophistication of your internet knowledge and research power. For example, the average person would not be able to access and search the dark web and black-market websites to ensure that their information is not out there for someone to steal. Further, accessing these websites could put you even further at risk without the appropriate security software to ensure your computer or other internet enabled device does not fall prey to the criminals who frequent these websites. The free credit reports out there, including Experian and Credit Karma, will notify you if your information is improperly used. However, Life Lock takes this a step further moving a step backwards to take preventative measures so that your information is never used improperly. Life Lock will find the issue before it becomes a problem. Another unique feature that Life Lock offers is the Life Lock Privacy Monitor Tool. This is proprietary technology and cannot yet be duplicated by anyone. This tool claims to reduce the exposure to the public of your personal information. This technology aims to keep your personal and private information private and confidential. Yet again, this is Life Lock working to prevent identity theft from happening in the first place, rather than just dealing with the problem after it has already happened. Another clear benefit from using Life Lock rather than attempting to track everything by yourself is the Life Lock One Million Dollar Protection Package. This package is designed to cover your expenses if your identity is stolen. With this protection you will be reimbursed for the cost of replacing documents, any traveling expenses, loss of income, a stolen handbag, purse, or wallet, for childcare and elderly care, any arrest related expenses, fraudulent withdrawals, legal costs, remediation service costs, and case management services as they relate to victimization through identity theft. So, is Life Lock worth it? The odds that your identity will be stolen are at about one in fifteen in a given year. Identity theft is a real and live threat for people across America, both children and adults alike. However, the majority of these cases are credit or debit card fraud. Federal laws and protections that credit card companies and banks have in practice will cover most of the financial impact on a victim in these circumstances. The liability that falls to victims with this type of fraud is minimal, so if this is your only concern Life Lock may not be necessary for you. As a matter of fact, the Department of Justice reported that in 2014 eighty six percent of victims of identity-based fraud did not incur any out of pocket costs for the crime. However, the bigger concerns that are rarer are not easily monitored in any other way. Once identity theft happens, or you suspect suspicious activity you can put a security freeze on your credit reports with the three major credit bureaus (TransUnion, Equifax, and Experian), but there is no real way to prevent this activity from happening outside of a Life Lock subscription. Life Lock will provide protection from any type of identity fraud or theft. The service will also alert you to any and all changes in your credit reports with the three major bureaus. Life Lock provides peace of mind above all else. With this service you know that your information is being monitored to prevent fraud or theft from happening. Life Lock will also support you if something does happen in terms of identity theft or fraud. Below are the most common questions and concerns about LifeLock. This section should be able to allow you to better understand the ins and outs of how Lifelock works as well as the processes involved with transacting with them. To make it easier for you, we have grouped the questions into relevant categories. Lifelock constantly monitors your credit, sets up barriers to improve your identity protection, and reimburses you should you become a victim of identity theft. In their more advanced membership plans, they extend their services to include notifications on data breach. Lifelock looks out for you and alerts you of any fraudulent and criminal activity done under your name. Essentially, they provide personal expense compensation, reimbursement of stolen funds, and compensation for lawyers and experts. If you have a need for their services, then yes. Lifelock works as an insurance of sorts in cases of identity theft protection as well as a secretary who manages and monitors purchases and activities that reflect on your records. Yes. Lifelock saves you time by monitoring on your behalf, and also saves you money by providing financial coverage in case of identity theft. Yes. In order to make it even safer, all Lifelock plans includes Norton anti-virus protection. Yes. This is a company that has been servicing the country’s needs for identity protection since 2007. The cost-effectiveness of Lifelock depends on the match between the kind of protection you need as well as the type of plan you availed of. Yes. Sometimes, their system detects false positives. However, if the identity theft threat turns out to be real, you’ll receive financial compensation from Lifelock to manage the situation. Yes, it is. A measly $9.99 per month is a small price to pay for identity protection and for avoiding any frutrations with dealing with such. In terms of features and coverage, the Lifelock Ultimate Plus is the best. However, we advise that you assess your needs first before committing to a plan. Lifelock is great if you’re looking for convenience and protection at the same time. While this service mainly works on identity protection, it also automates a lot of tasks that you usually do on your own. Their membership cost starts at $9.99 per month plus the applicable sales tax. You can also avail of their more expensive membership types should you deem it more fit to your needs. No. However, they do offer a 60-day money back guarantee for all their plans which essentially makes their service free when you cancel. Lifelock Ultimate Plus costs $29.99 per month. They recommend this plan for those who have higher net worth and have retirement and 401(k) investments. Lifelock Ultimate Plus is the most comprehensive package they offer. With this package, you will be eligible to up to $1 million each for personal expense compensation, stolen funds reimbursement, and lawyer and expert fees. Lifelock Benefit Elite is a package that may be purchased by an employer for its employees. Its features are essentially the same as with the Lifelock Ultimate Plus but can only be availed of in bulk. Lifelock Advantage is their mid-level plan costing $19.99 per month. They recommend it if you have more than 2 bank accounts and have substantial savings. Lifelock Standard, the most basic plan, guarantees you up to $25,000 in stolen funds reimbursement, up to $25,000 in personal expense compensation, and up to $1 million for lawyer and expert fees. Lifelock Senior is a plan specifically designed for those aged 55+. It offers the same features as your basic plans but with the permission system that allows a trusted younger adult to monitor the account as well. Lifelock does not offer a family plan per se, but you are free to customize your own package. For every child in your home, you only have to add $5.99 per month to get them covered as well. There is no fixed cost on family their plans because you design your Lifelock package. However, you can lower costs by paying annually instead of monthly. Lifelock is a company that offers identity theft prevention service which it fulfills by placing guarantees with every plan and by setting up protections to avoid anyone from stealing your personal information. While it was founded by Robert Maynard Jr. and Todd Davis, the former is not affiliated with Lifelock anymore. It also currently operates as a subsidiary of Symantec. Yes. Since it was bought by Symantec, Lifelock became more popular and more trusted in the identity theft protection community. Lifelock is based in Tempe, Arizona. Still, you can access their services online no matter where you are in the US. Symantec bought Lifelock in February 2017. Scott C. Taylor was installed as the CEO the same day. No. Norton may provide the antivirus program to all Lifelock members, but it is an entirely different identity protection provider. Lifelock was founded in 2005 and has been around for 13 years. This section should guide you with signing up or cancelling your account with Lifelock. To sign up, go to www.Lifelock.com/store. Then, choose the coverage you prefer and provide the information required to complete your application. You need to provide personal details to verify your identity, payment information, as well as government identity information. Lifelock makes it a point to only ask for information that they would actually use. There are two ways to cancel your membership: through the member portal or by calling 1-800-LIFELOCK. You may use what is the most convenient for you. Once you log in the membership portal, click Request Support then Cancel. Your membership will be terminated immediately. The whole process, whether by phone or online through their membership portal, is pretty easy. According to reviews, however, it is most preferable to do it online. Yes. With Lifelock, you are under no contractual obligation to maintain your account for a certain number of months/years. No, because the very point of getting Lifelock is to prevent identity thieves from accessing your credit. However, you can still opt to have it frozen on your own. Yes, but only to you through their secure membership portal. Lifelock instantly collects your credit report from the three credit bureaus so you can review the transactions listed in them. The Lifelock identity alert system is a system of communication used by the company to alert you of any suspicious identity threats. It can be delivered via text, email, or phone. Through their Norton Security, you are assured that identity thieves will not steal your personal information saved on your devices. However, it is recommended that you always exercise due diligence. 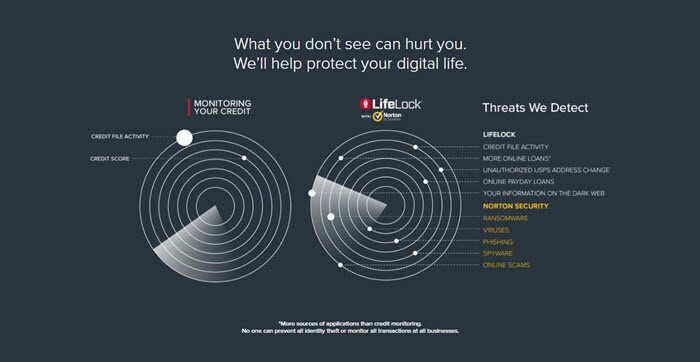 Lifelock monitors your credit report and essentially the whole internet in search for identity fraud that can damage your finances. Needless to say, their services extend beyond merely monitoring. Lifelock uses the most sophisticated and most popular anti-virus to prevent hackers from stealing your information. Also, they monitor more than 10,000 websites in deep web and on the internet to look for data that may be linked to identity fraud. Yes and no. They would alert you if someone took over or add new account holders to your account. However, they do not monitor every transaction made using your accounts. While Lifelock automatically retrieves your credit report from the credit bureaus, they don’t monitor it. This service still makes it easy for you to detect fraudulent transactions early on, though. Yes. Monitoring the dark web is part of all plans that Lifelock offers. Lifelock app is the mobile application that you can download once you avail of any Lifelock membership plan. This app offers the same features of the desktop version, only more convenient as you can take it wherever you are. 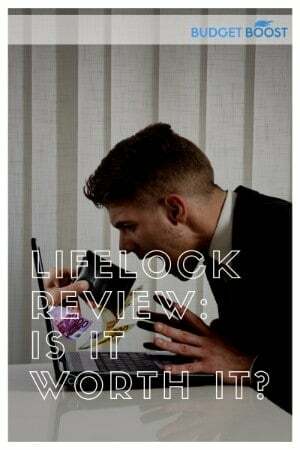 Since Symantec, Lifelock wallet for both free and paid versions have received positive reviews. This wallet is highly encrypted to ensure that all the personal information you store in it remain safe. Lifelock Command Center is an additional service that Lifelock provides for a fee. Essentially, it is a more comprehensive version of their service that protects you from other types of identity theft. Definitely. You are guaranteed protection from identity theft. Else, you are compensated an amount not exceeding what your plan indicates. Beyond the what’s and how-to’s, you may still have questions about LifeLock about coverage, tax deduction, and the likes. Here, we address them all. All companies offering the same service as Lifelock have their own strategies in employing identity theft protection. You have to make your own decision on this based on your budget and your assessment of their services. This is not true at all. If you’re from New York, you need only to sign a Certificate of Insurance. Unfortunately, Lifelock is deemed a personal expense. This means it is not tax deductible. No, it only covers you. Your spouse would need to purchase a membership as well for identity theft protection.